I am honestly not sure how to qualify my pinterest pins as “favorite” pins, I pinned them all because I love them or want to try them! So instead I’m going to share my 10 of my recent pins. Think of this as a look into my brain, because I tend to pin things I’m thinking about! This is a cleanse diet I read about at Heart Shaped Sweat. I am interested in trying it! Gabbie wants to have an art themed birthday party and I thought these would make good party favors. Green smoothies are yummy. This is one I want to try. I love the idea of having certain key items that mix and match into different outfits. I have a pallet in my garage and I want to do something cool with it! This is an idea I might incorporate in Gabbie’s new room when we move the bedrooms around eventually. This was another idea for wall art for Gabbie’s room. I would like to do something like this with Simon. I want to look into the idea of Love Languages and showing love to children in various ways. 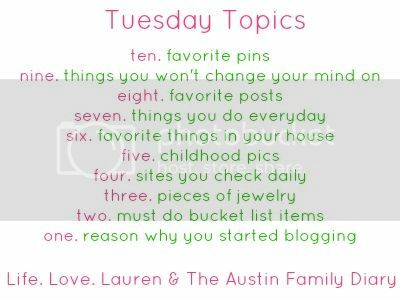 I have not been pinning things as much as I used to, but I still love using pinterest as a virtual bulletin board!